Marbles For Polish | Water marbled nails & more! 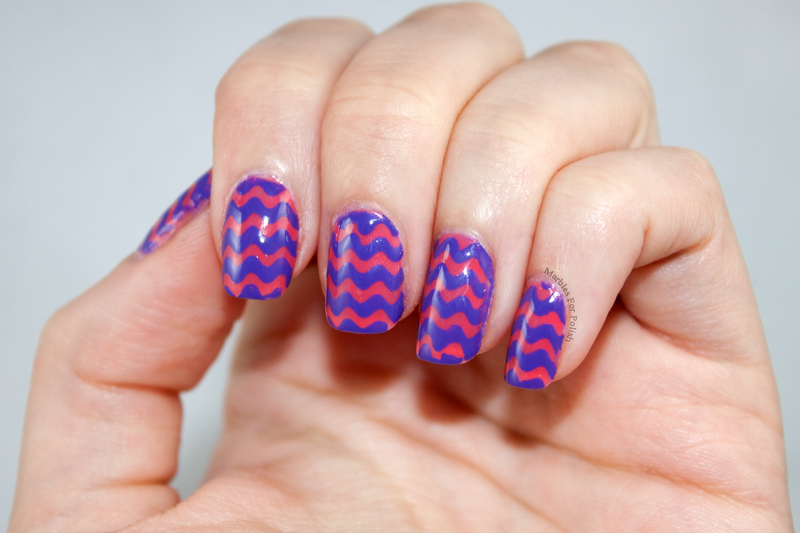 Water marbled nails & more! I did it everybody! I got through my entire color challenge using this color pairing chart. Last on the list is navy and lavender. I two coats of Marbles For Polish Lavender Macaron and then hand painted messy stripes on with Zoya Sailor. I actually started fairly neat on my right hand but got impatient and by the time I got to my left hand this was the result. I think this is actually the mani that got the most compliments out of all my color challenge ones. I was a little bummed about how sloppy it was at first, but the more I looked at it the more I liked it. My husband even said it looked like I did it on purpose because of how evenly spaced the stripes were. The color pairing itself isn’t my favorite, but I think this is one of my favorites out of the whole challenge. I also realized that I have a striped shirt that’s these exact colors! 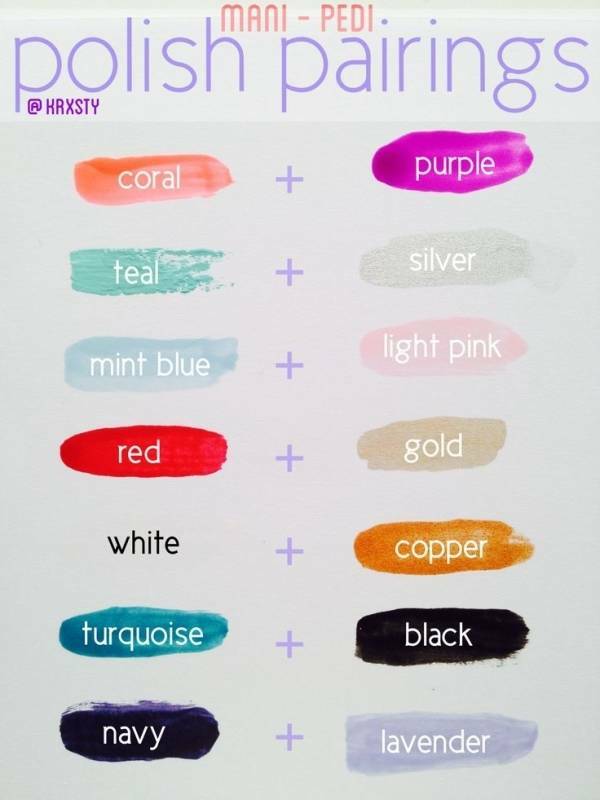 If you have any color pairings on this list please go to my facebook page and post your pictures in the comments of the corresponding posts. And on another polish note, I’ll be releasing my Sailor Moon Crystal collection as a discounted pre-order this Friday, September 4th! Single full sized bottles will be available for purchase at $9 each AFTER the pre-order is over; the last day to pre-order will be September 8th. During the pre-order you can get either the full sized collection for $40 or the mini collection for $20. Blog posts and swatches for this collection are starting to come out, so keep an eye out for those. You can also find more info about these polishes on my facebook page or my facebook group, Marbles For Polish and More! We’re coming up to the end of my color challenge posts now. The 6th combo is turquoise and black which I was pretty excited about. I knew exactly what I wanted to do for these colors. I tried a new to me technique, water spotting. I started with a base of Zoya Talia. I then started the same process you would when water marbling. I dropped some Zoya Willa over the water, but instead of adding other colors or making a pattern in the polish, I used a spritz bottle filled with alcohol and sprayed the polish. The alcohol causes the polish to separate and you can dip your fingers in just like water marbling. I’m not sure if my water conditions weren’t right, but most of my nails got more of a smokey effect. It still looks cool, but I was going more for of a veiny look to represent actual turquoise. The closest I got was on my pinkie and ring finger on my right hand, which were the first nails I did. I’m definitely going to try this method again at some point. 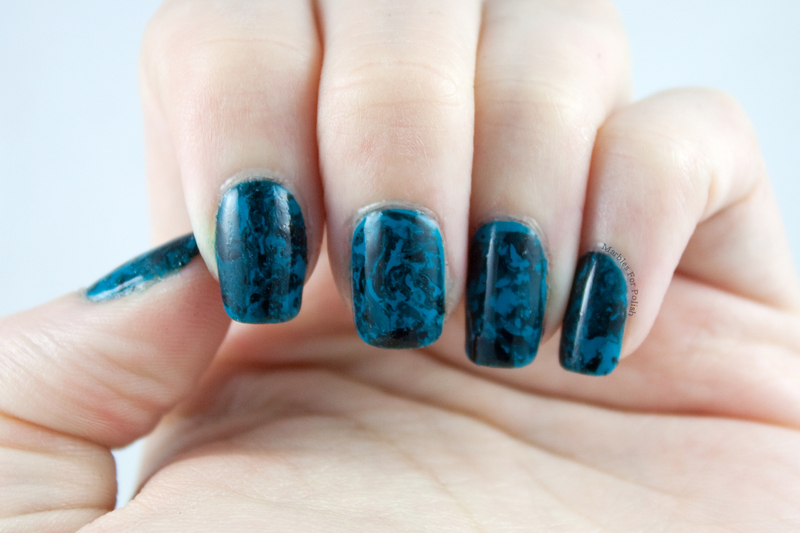 Have you tried water spotting before or do you have a turquoise and black mani to share? Feel free to post your color combo manis in the comments on my facebook posts that link to each color challenge blog post. I also wanted to share my customer appreciation sale. I know a lot is going on in the indie polish world right now between damaged nails, deception, and bigger brands closing. I haven’t had any issues with my customers and I’m so thankful for that. I will continue to create and test to bring you all a quality product, as you have continued to support me and other great indie brands. 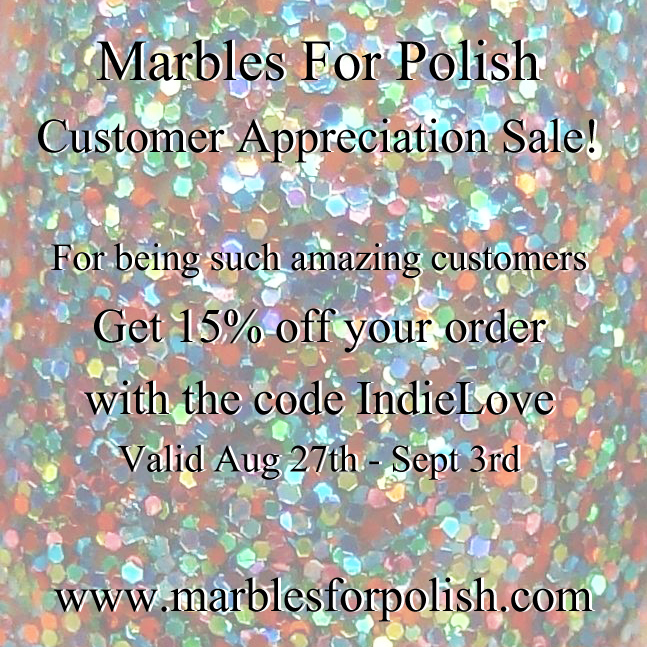 Use the code IndieLove at marblesforpolish.com for 15% off your order through September 3rd. I’m getting close to the end of my color challenge. It’s been super fun coming up with these great color combos and what kind of nail art to do with them. 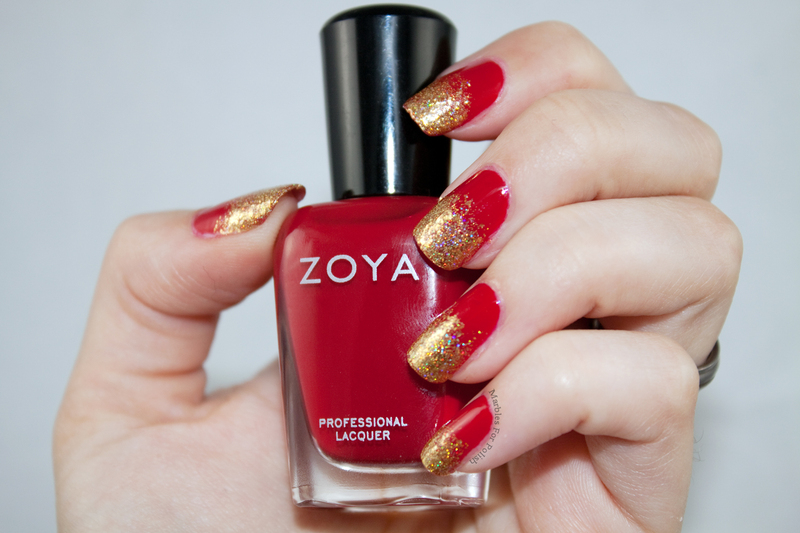 This time around I did a white and copper mani with Zoya Purity and Autumn. I started with one coat of Purity and then water marbled Purity and Autumn. I haven’t done a water marble in a while and I think this was pretty successful for how long it’s been and how rushed I was at the time. This one came out pretty consistent because of the way I made the pattern in the water. I also used a peel off base coat around my fingers instead of vaseline and tape like I normally do. It really helped with clean up so I think I’ll do that from now on. 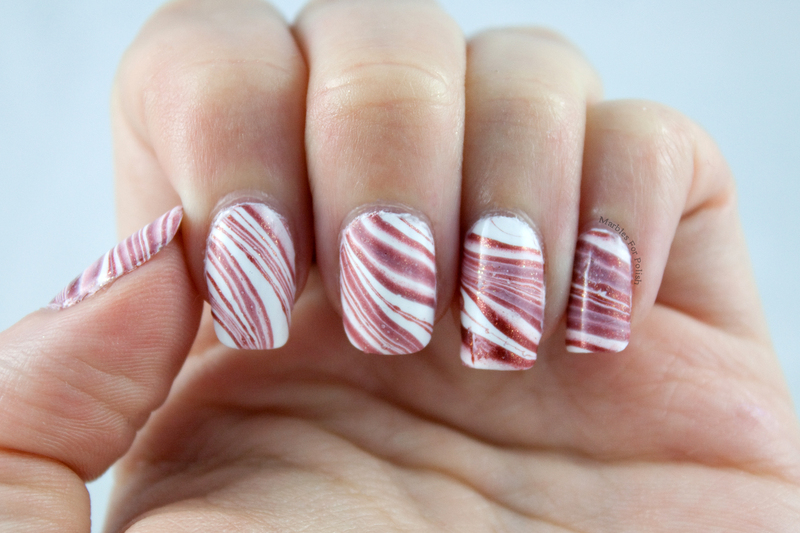 I think next time I do another water marble I’ll experiment with different patterns to see what I can get. I do like this color combination but I’m not sure if it’s really me because I’m always a little iffy about white nails on myself. Next up will be turquoise and black which I’m pretty excited about. Let me see all your color combo manis in the comments of my facebook posts! I’m back with another color challenge today! This time around is red and gold, only three more to go now! I’m very excited about doing the next few. I used two coats of Zoya Livingston as a base and I sponged on Marbles For Polish Golden Daze as a glitter gradient. Golden Daze is one of my newly released glitters than can be worn on it’s own or as a glitter topper. You can find it along with another ten new polishes in my etsy shop! 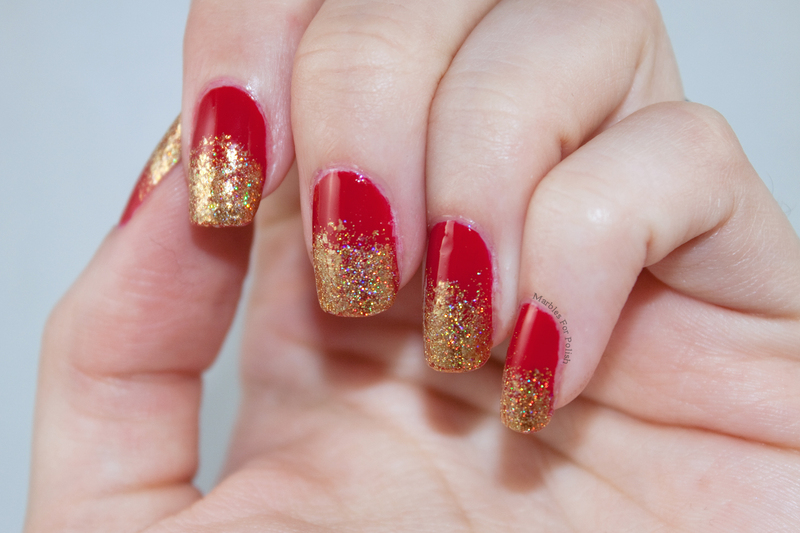 Here are a couple photos with flash to show the gold holo micro glitter in Golden Daze. I love how sparkly it is! How do you guys like this one? I’m still obsessed with all things holo since it’s been so sunny lately, so Golden Daze and my other glitter toppers really satisfy my craving for rainbow bling. 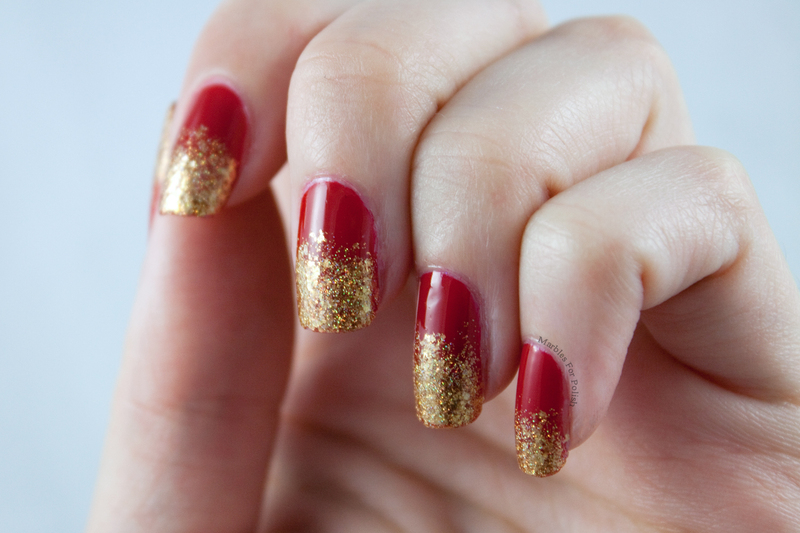 And don’t forget that if you have a red and gold mani, or any of the other color combos I’ve posted do far, go check out my facebook page and comment with your pictures on each post. I’m back with my third color challenge post! This one called for using mint blue and light pink together. I searched my Zoya shelves and found the closest I had to these colors, Lillian and Cassi. I think I should have tried for a pink from another brand because Cassi ended up looking more peachy over the blue. I wanted to try my hand again at a candy floss mani and thought these soft colors would be great. I started with two coats of Lillian then dropped some of Cassi into the back of a swatch nail wheel to let it get a little goopy. When Cassi was a bit dry I used a toothpick to lay strings of the polish over my nail. I think besides Cassi being a bit too peachy, it may not have been the best finish for this method, a regular creme may have been best. Despite some not so great choices, I do kind of like this mani and I got some compliments on it. I may try this method again with different colors, possibly a more shimmery base with a creme on top. Have you ever tried this method? I’d love to see your candy floss and color challenge manis in the comments of my facebook post. And don’t forget (or for those of you who haven’t seen) that I’m releasing my essentials polishes along with a few others today! Check out my Etsy shop for the new polishes and more. Hey everybody, I’m back with the next color pairing on my challenge list. Today I’ve got teal & silver, this is my favorite one so far but I’ve still got the last few to paint still. 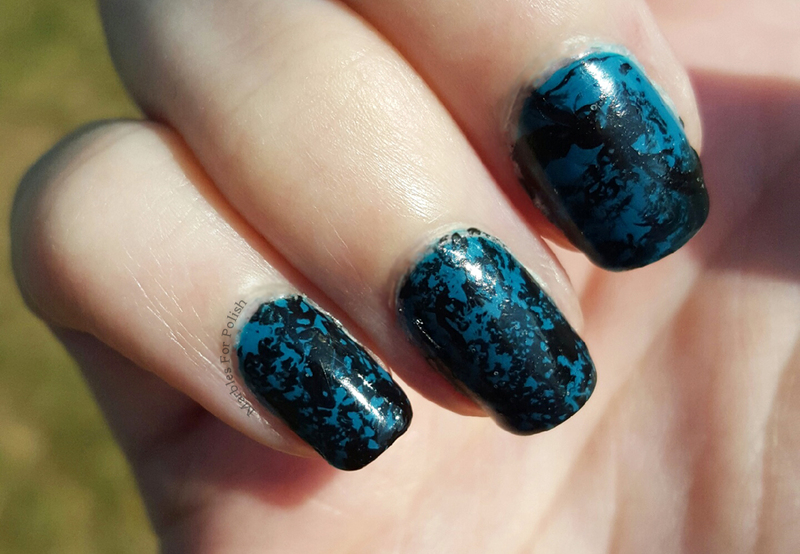 This is actually my first negative space mani, though I kind of did a faux version since I had some staining. I started with a tinted base coat and then a coat of Zoya Lulu to cover up the staining. They were both still sheer enough and close enough to my natural color that it still looked like negative space under the other colors. 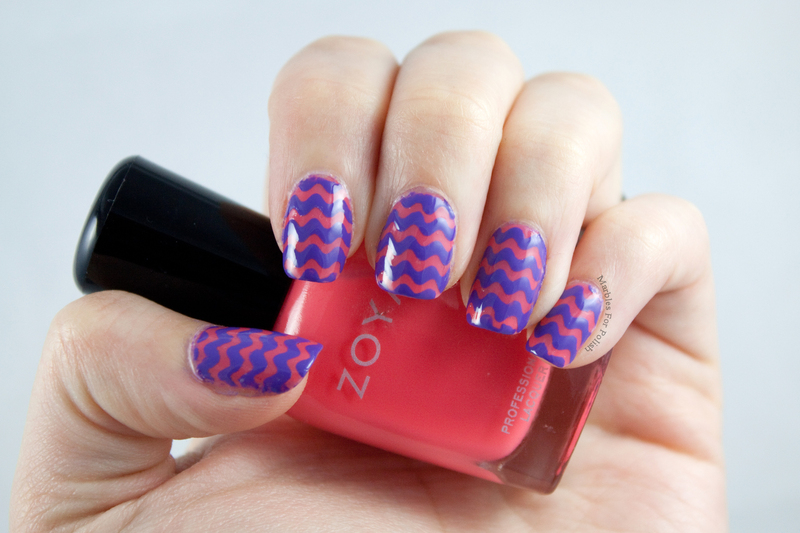 I then used scotch tape to create a triangle stencil and paint Zoya Trixie closest to my cuticle. The tape ended up getting a little messy so I had to do some extra clean up without removing the sheer polish. I definitely could have done it a better way but once I started I just rolled with it. 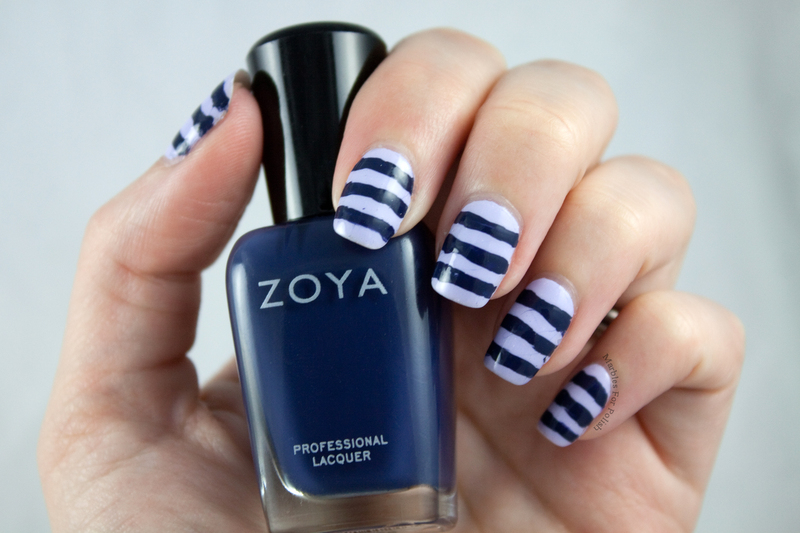 Next I used striping tape to separate the next area and painted Zoya Wednesday up toward the tips of my nails. I did a top coat which evened out some of the imperfections. I’m so happy with how this one came out. 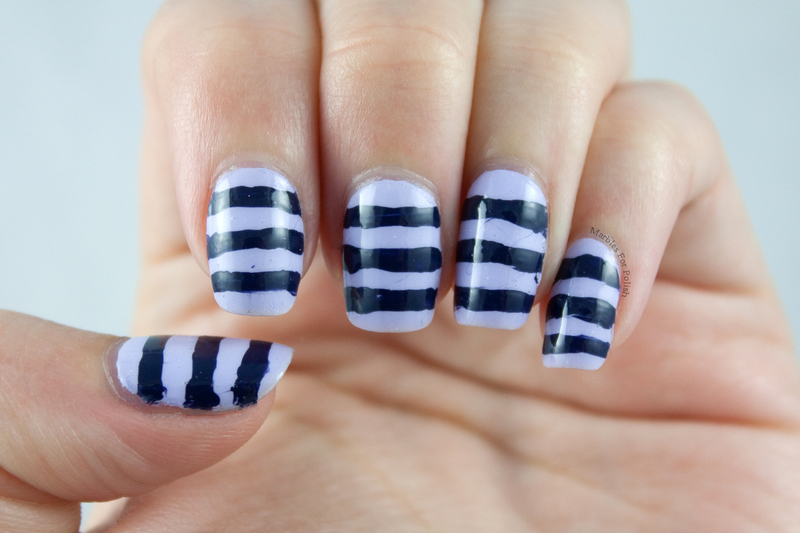 I can see myself doing this negative space pattern again with other colors as well as trying other negative space manis. 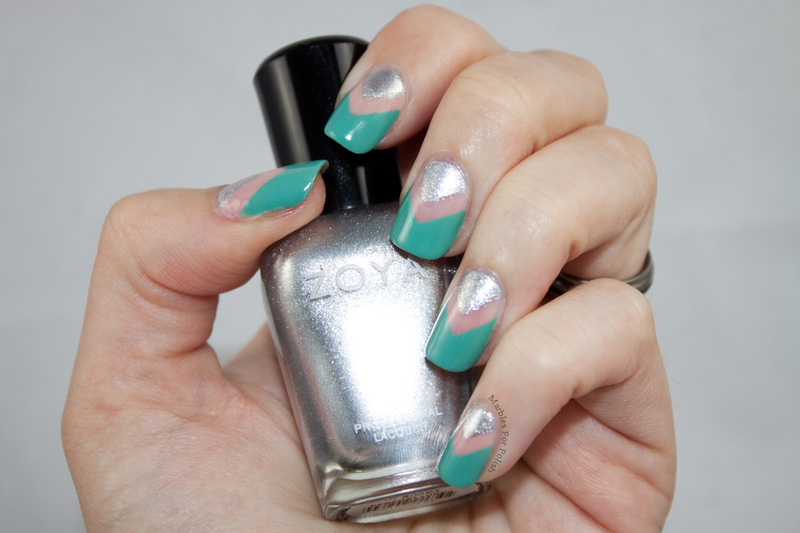 I would love to see both your teal & silver pairings and any negative space manis you have. To share, please check out the post I’ve made for this blog entry on my facebook page and leave your pictures in the comments. I really love reading beauty articles, sometimes I even read certain ones more than once even if I’m not going to use any of the tips or techniques. I recently found an article that had a lot of great tips and images, one being this image for mani & pedi color pairings that I spoke of in my last post. I took this more as pairing these colors in nail art than doing one color on your fingers and one on your toes. So I’ve decided to do each of these and blog about my pairings. I’m doing them in order, so without further ado, here is coral and purple. 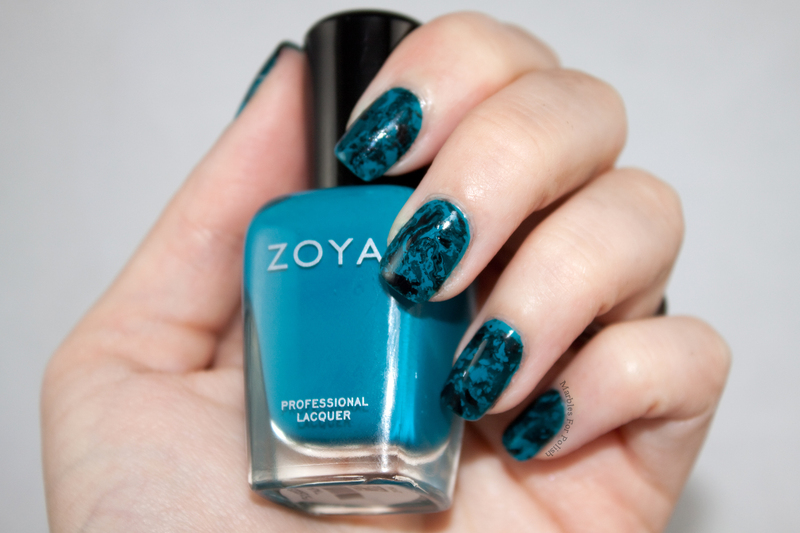 For this mani I started with two coats of Zoya Maya and then top coated it. I used ric rac vinyl nail stencils from Vinyl It Up and painted Zoya Serenity over top then top coated again. I still haven’t quite gotten the hang of vinyls yet but I think they came out alright. I do like this color combo and I love how squishy it looks with the more sheer Maya underneath. I’m already having a lot of fun with these manis and at the time of this post I have the next few already done and photographed. I would love to see your color pairings too! You can post your pictures of coral/purple manis directly on my link for this blog post on my facebook page so everybody can see and get ideas of their own. Look out for my teal & silver mani on Monday, I’m so excited about that one! Donate fund for polish and supplies.